The License Guru also offers Corporate and LLC Kits Seals and Stock Certificates! All corporations and LLC’s are required to keep a company “minute book”. Organize your new or existing company the right way with the best in Corporate and LLC Kits. These attractive, custom-made kits are invaluable in keeping your Corporate Bylaws, Operating Agreements, Stock Certificates and records organized properly and efficiently. 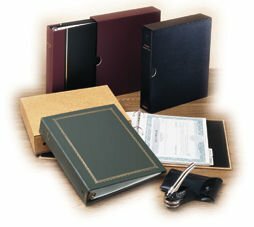 Includes: Company name gold-embossed on spine, 3-ring binder, slipcase, 20 Stock Certificates (or Member Certificates), Corporate or LLC seal (with engraved company name) , sample Bylaws (or Operating Agreement) and Minutes, Stock Transfer Ledger (or Member Ledger) and mylar-coated index tabs. Get your Corporate Kit Seals and Stock Certificates Kit Today! Note: This kit is for existing corporations or LLC’s only. You can also purchase this kit when you form a corporation of LLC. Click here for more information.